We are planning two big projects in April, and wanted to get started on the right foot by finishing up our little projects and getting the rest of the house cleaned up! You can call me crazy now or later, but I'm writing it down anyway--I'm having a party with some girlfriends the last week in April and want to have our powder room totally redone by then. Jason suggested how about we do the guest bath at the same time?? We're going out of town next weekend and so will have two solid weekends to do demo, tile floors, baseboards, plumbing install, vanities, and hardware for both bathrooms. We'll see how it goes!! In the meantime we just had to get some of the lingering last steps and clean-up done for other things we've done lately. 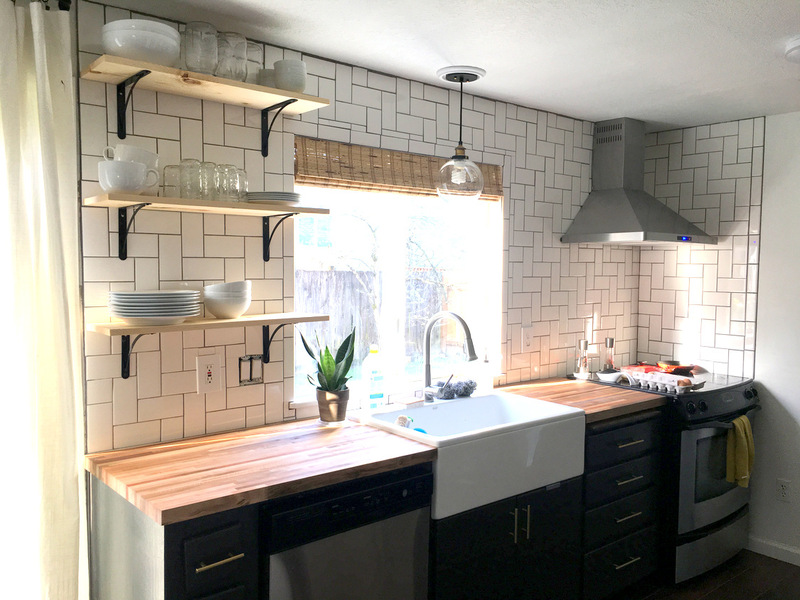 The big news is we got the kitchen tile project almost all wrapped up, including shelves, counters, etc. That is a HUGE weight off my shoulders and it's so exciting to have a functional kitchen!! Here it is as I write this post. Still need to finish up switchplate installation, caulk the ceiling and counters, and touch up paint outside the grout. And install the quarter round at the base of the cabinets, but I'm hardly counting that. And we will probably need to buy a new range and get some electrical work done. We had quite the list of to-dos. Here it is--we got the crossed-off ones done! As usual, things take longer than you think they will so we didn't get anywhere near working on the stairs or getting a head start on bathrooms. And, of course... 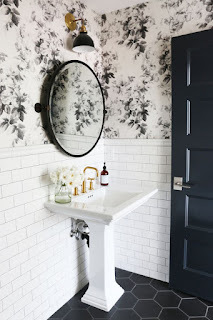 I've been online shopping for supplies for our bathroom renos! Here are a few of my biggest inspirations for the guest bath... following some big decisions after this post, thank you for your suggestions here and in this Instagram post! 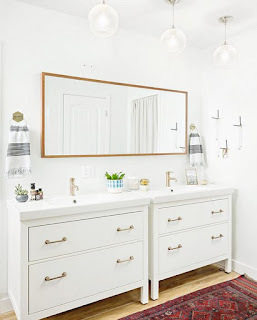 We are going to buy an IKEA white Hemnes vanity for the guest bath!! Big step, starting to spend the real money on this project! How cool do they look in this image, with the handles swapped out?? So one of my other to-dos this week is to make a shopping list of supplies for the bathrooms. I have 2-3 weeks for things to get here so we can install on schedule! Despite all of our work here at the Stanley 90's reno I've never done two expensive, concentrated, time-sensitive projects at once like this so I am definitely a little nervous. Feeling powerful after our week of knocking out so many little tasks, though!